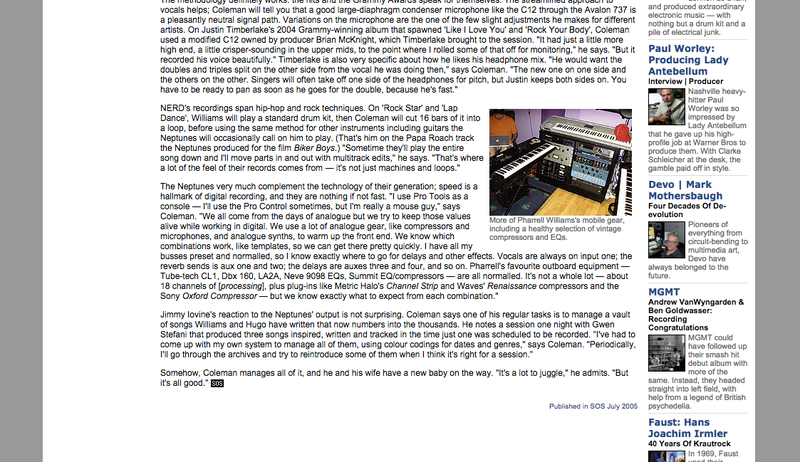 "There are quite a few plug-ins on Kendrick’s vocal. He has a real raspy, mid-range vocal, so I use the Renaissance Compressor to smooth that out. I have it in manual and opto modes, with the threshold all the way down to -18, so if anything in the mid-range leaps out too much, it keeps that in check." "waves bundle fx are very good, we use the C4, the Rcomp, the REQ and the L2 a lot"
Spotted on "Fred Falke In The Studio" with Futur Music Magazine. In this [interview](http://www.soundonsound.com/sos/jul05/articles/andrewcoleman.htm) Pharrell's engineer Andrew Coleman talks about using the Waves' Renaissance compressor. "It's not a whole lot — about 18 channels of [processing], plus plug-ins like Metric Halo's Channel Strip and Waves' Renaissance compressors and the Sony Oxford Compressor — but we know exactly what to expect from each combination." When asked about a favorite compression plugin, Nick Harriman of Dusky answers: "Waves Renaissance for squashing the vocals a little bit and the Logic compressor for sidechaining." Originally sourced from [this Sept 2013 article](http://www.earmilk.com/2013/09/24/earmilk-interview-dusky/). Used on Shakira vocals for "Hips Don't Lie". Disfunktion posted this photo on their Facebook fan page which shows them utilizing the Waves Renaissance Compressor Plugin with this caption: "Studio day!" It’s all about getting something to sound the most inspiring as quickly as possible, to keep the momentum going. You would think that more advanced producers would want infinite parameters in their tools. But in truth, I’ll use something like Renaissance Compressor – I’m a big fan of optical compressors. Either that or the Renaissance Vox comp – it has a way of placing vocals perfectly in the mix without the compression being noticeable or harsh. Very transparent and smooth. I probably use it more than any comp; I can get good results fast and keep it moving. At the minute 20:35 we can see Renaissance Compressor from Waves. At 33 minutes and 37 seconds in the video attached you can see the Waves Renaissance Compressor. Im Musikvideo "Eloah" kann man bei 0:56 den Renaissance Compressor sehen. 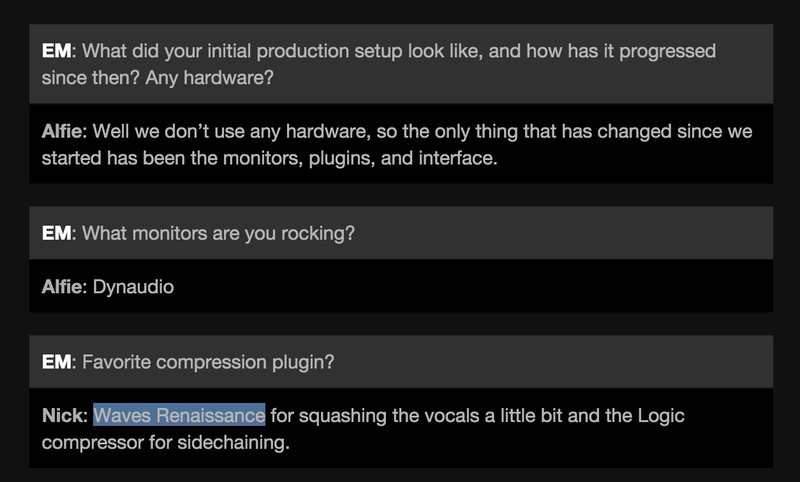 No reviews or videos yet for Waves Renaissance Compressor Plugin. With an Equipboard account you can rate this item, add it to your collection, submit a review to discuss what you like and dislike about it, and associate Waves Renaissance Compressor Plugin to artists that use it. Create an account!